When you need reliable auto repairs in Pennsauken Township in New Jersey, you should feel confident bringing your vehicle to AAMCO of Pennsauken. Our highly-trained service technicians utilize the latest technologies and diagnostic equipment available to complete a thorough evaluation of your vehicle’s repair needs before moving on with any repair work. Because car repairs can be stressful, we strive to make you feel welcome and comfortable while in our auto repair shop. Whether you’re a local or someone just passing through our area, we pride ourselves upon providing honest, complete service to everyone. That’s because we understand that our reputation is tied to every customer who walks through our doors. You can rest assured that we’ll never try to upsell you on an auto repair that you don’t need. Whether you own a foreign or domestic vehicle, you can count on AAMCO of Pennsauken for all your transmission and auto repair needs. Our repair services include transmission repair, rebuilding and replacement of both manual and automatic transmissions, as well as complete brake repair and service, differential repairs and overhauls, engine tune-ups and fuel injection cleaning, steering and suspension repairs and so much more. If your vehicle is making unusual noises, we offer free inspections. Contact us to schedule an appointment and discover the AAMCO difference today. 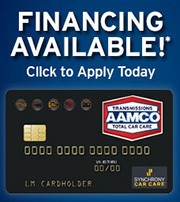 Be sure to ask about our special offers and financing upon credit approval options! I was leaving work when what I thought was my transmission went out. Had my Tahoe towed to AAMCO. They were getting ready to close but waited for my vehicle to arrive. I told them what had happened, Turns out it was my transfer case. I was given several options for repair/replacement and cost for each. I gave them the go ahead and had my vehicle back in two days!! Because of their honesty and service we took my wife's van in for service. Again we had it back in two days! Her van is now running as smooth as the day we bought it! I highly recommend AAMCO if you want honest service and repair at a fair price!! John and his team at the Pennsauken AAMCO are the freaking BEST! They always take the time to make me feel important even though I'm not. One time, I called freaking out like a fool, and they were so nice about it. They've never overcharged me, never pressured me into service I wasn't sure of, never made me wait three times as long as expected. They are respectful and prompt and so popular, you need an appointment. I'm happy to wait: In the auto industry, they are a freaking Godsend. My old car was never treated better. Courteous people , excellent service. Made an appointment, dropped my car off and was given a ride to work . John let me know what the cost and repair time would be. Would recommend. We use AAMCO for all of our family's car care needs! They have changed starters, replaced motors, brake jobs, oil changes, window motor replacements and many more services over the last 5 years! Great customer service and extremely professional mechanics. This is the only place we trust our family's vehicles to be worked on! Traveling cross country for business when one of the catalytic converters broke down. Called this AAMCO and had it towed in. Service was prompt and friendly. They were able to fix it and we are now on our way again. The repair costs were very reasonable, the manager was professional, honest and friendly, and his offer to assist with any follow-up problems are very reassuring. I would recommend this business to any family, friends and anyone else needing assistance. I brought my car to Aamco Transmission for serious work to be done. They explained my options and worked with me to find a solution. I never was a customer before. I am now. I recommend this shop to everyone requiring work on transmission and/or regular vehicle maintenance. Friendly staff - will go the extra mile. If you want honesty and great customer service and awesome work then this is the place to go, AAMCO came highly recommended by a couple of coworkers and now I know why. The guys at the shop are great and very professional, they did some warranty work on my Subaru WRX STI transmission. They did a great job had a small issue and they fixed it promptly and even went as far as to hand wash my vehicle for me. I cannot say enough about the owner or this shop I will definitely be bringing all my vehicles here and recommend this shop to all my friends,family and strangers, they have made a customer for life. I would have been happier to have not needed their help at all—but if you are stranded and need a whole new transmission in your car, these guys will bend over backwards and put in the extra time and effort to help get you back on the road quickly and safely. The worked on my car in conjunction with AAMCO Turnersville. Kash was always professional. Very friendly. Thank you. Very courteous and friendly! Really took the time to look into my car's problems, and gave me great solutions on how to fix my car's transmission. © 2019 AAMCO of Pennsauken. All Rights Reserved.